Scientific method – How old is the earth? I also want to direct readers to @jammycakes review of Answers in Genesis’s (AIG) 10 best evidences for a young earth. He goes through all ten, doing a careful and well researched fact check. @jammycakes does not make use of methodological naturalism, but just looks at the honesty and accuracy of the claims made by AIG scientists. I heartily recommend Dr Swamidass’s blog, Peaceful Science, to anyone who is interested in discussions about science and faith. He has an interesting take on the subject of Adam and Eve, and shows that even though there is a lot of evidence for universal common descent, it doesn’t rule out the possibility that they could have been created specially and separately. He also mentions Todd Wood, a young-earth creationist scientist. If there’s one YEC who I think is well worth paying attention to, Todd Wood is the one. As well as being refreshingly honest about the evidence and gracious and understanding towards us old-earthers, he has a passion and enthusiasm for both science and his Creator that is kind of infectious. I always find his blog a joy to read. The problem with methodological naturalism is that there’s a lot of confusion, especially in Christian circles, about what exactly it stands for, especially regarding the question of supernatural and miraculous explanations of scientific phenomena. Some Christians believe that it mandates an explicit a priori rejection of any such explanations, to the extent of being atheism in all but name; while others insist that it does not, but merely teaches that God designed His creation to operate according to certain pre-defined rules that He is at perfect liberty to override when He sees fit to do so, and that it is only concerned with studying those rules. Unfortunately, the discussions can get pretty confusing at times, and can all too easily result in misunderstanding, accusation, and counter-accusation that generates more heat than light. Besides, it completely misses the important issues at the heart of the matter. Rather than getting bogged down in such discussions, I decided to avoid appealing to methodological naturalism altogether. From the outset, I have maintained the position that miracles can and do happen, and that they are a valid and legitimate explanation for scientific data — provided that two important conditions are met. First of all, the evidence that they explain must be reported accurately, processed correctly and carefully, and interpreted coherently. In other words, no quote mining, no cherry-picking of the data, no exaggerating, no arithmetic errors, and so on. You have to make sure your facts are straight about what the findings in question actually are. Second, the miracles that you are proposing must not be deceptive in nature. The Bible tells us (e.g. in Romans 1:20) that what we see in creation is an accurate reflection of the nature of God, and miracles whose only effect is to make the earth look older than it really is would cast God as a deceiver — especially when you consider that many events in the Earth’s history have been constrained by multiple independent methods to times that in some cases can be as tight as one part in ten thousand. I’ve written about this before. I really, really do not like arguments against creationism or ID that dismiss it as “religion, not science,” or that complain about its proponents “introducing religious presuppositions into science.” Regardless of whether such objections are valid or not, that is not the problem, and it totally misses the point. If someone wants to look for evidence of miracles or irreducible complexity, by all means let them. If they want to look for Noah’s Ark, or modern-day dinosaurs and humans living together, or even evidence to support a young earth, again, by all means let them. The time to raise objections is when they start misrepresenting their findings, taking shortcuts, cherry-picking data, or refusing to be held accountable for meeting basic standards of honesty, factual accuracy and quality control in their claims. But objecting to them even asking the question just shows that you are operating with anti-religious and quite possibly discriminatory presuppositions and biases of your own. Featured image: an evening sky over the village of Thwing, East Yorkshire. Photo by me. There is a right way and a wrong way of responding to Literal Six Day Young Earth Creationism. The wrong way: object to their religious presuppositions. Do not object to them introducing religious presuppositions into science. Do NOT object to them introducing religious presuppositions into science. DO NOT object to them introducing religious presuppositions into science. As soon as you’ve gone down the route of objecting to their religious presuppositions, you’ve lost the argument. This is because YECs believe that you are motivated entirely by presuppositions and biases of your own. The fact is that there is a very real anti-Christian bias evident in many parts of academia, culture and society. It may not be quite as caricatured in the God’s Not Dead movies, but it’s very much there, and young-earth creationists automatically assume that it is the main, if not the only, reason why they can’t get creationism taught in science classes in schools. Even if you believe this perception to be illusory, by framing the debate in terms of religious presuppositions, you are just confirming it. This adds fuel to the fire, causes them to dig their heels in, encourages other Christians who are “on the fence” about the whole matter to join them in the young-earth camp, and can make scientifically literate Christians, who are best placed to bring correction on the matter, reluctant to do so. On a similar note, do not describe yourself as “opposing creationism” or “combatting creationism” or “arguing against creationism.” By expressing opposition to creationism itself you are giving yourself the appearance of being motivated by your own presuppositions again. You are also giving the impression that you would not take them seriously even if they did manage to come up with rock-solid, indisputable, watertight evidence to support their case. It especially makes me cringe when I hear Christians making this objection. This is an objection that is very easily misunderstood, and you can all too easily end up sounding like a non-Christian when you’re making it. It also opens you up to charges of “compromise” — a favourite YEC accusation. So be careful. Furthermore, if the only problem with YEC were religious presuppositions, then the evidence would be ambiguous, and it really would be possible to look at it through different “glasses” and see six thousand years rather than 4.5 billion. The right way: demand that they get their facts straight. What you are to oppose, combat, and argue against, is sloppy thinking, falsehood, unjustified assertions, and resistance to critique. As such, your response to young-earth creationism needs to be simply a demand that YECs get their act together and start applying the same standards of rigour and quality control as everybody else. For this is the real problem with young-earth “creation science.” Their technical standards are so low that in any other area of science or technology, they would kill people. They are at times willing to tell outright falsehoods in order to support their position. They refuse to be held accountable to anyone outside their own echo chamber. And they show a cultish hostility to critique even from concerned Christians who share their stated goal of seeing the Bible upheld as the Word of God. Most rank and file YECs aren’t even aware that this is an issue. When I tell them that science has rules, their natural tendency is to assume that I’m talking about a rejection of miracles. I have to make it clear to them what kind of rules I’m looking for, and that rejection of miracles has nothing to do with it. No arithmetic errors, no quote mining, no fudging of the data, no misrepresentation, the need for adequate peer review and replication, and so on. Basic standards of honesty and quality control — and furthermore, very much in line with what the Bible itself demands in terms how we handle weights and measures (cf Deuteronomy 25:13-16; Proverbs 11:1). I say that to break these rules in order to “fit Scripture” is neither scientific nor Scriptural. Yet time and time again, I see young-earth arguments that completely disregard these rules, and then cry “compromise” or “persecution” even over mistakes as egregious as misquotes, arithmetic errors, and cherry-picked data. The fact is, most YECs agree wholeheartedly with these rules in principle. They just aren’t aware that bad arguments from the young-earth camp are a problem — mainly because many of them lack the scientific and technical understanding to be able to fact-check them. Addressing the issue of quality control is hard work, to be sure. You have to make sure your own facts are straight as well, and it can also be difficult to communicate the nature of the problem clearly and in an easy-to-understand way to people who very often have little or no scientific training. But it is very, very necessary. Now I’m going to start off with a trigger warning here: this post contains equations. If that puts you off, then don’t even think of wading into the creation and evolution debate. There are many, many aspects of the subject that involve mathematics, and if you aren’t able to get your head round that simple fact, you will just end up getting things wrong, claiming that evolution is about crocoducks and shape-shifting cat-dogs, looking completely clueless, and undermining everything that you stand for. Having said that, the equations in this post aren’t particularly advanced, and I’m more interested in drawing your attention to the fact that they exist than trying to do anything with them. But they are important, because they concern one of the most fundamental, basic skills in science: the art of measurement. As such, this is the first thing that you learn in the first half hour of the first practical class of any undergraduate physics degree course. Working scientists need to know this stuff cold — and so too does anyone who wants to teach in their church about creation and evolution. Now when I talk about measurement, you probably think of getting out a tape measure, stretching it from one end of a piece of furniture to the other, reading a single number off it, and leaving it at that. Your desk may be 180 centimetres wide, for example. But that’s all you get — a single figure. That single figure isn’t good enough for science. When scientists measure things, they don’t just want to know the value itself; they also want to know how much confidence they can place in it. For that reason, they always seek to determine its uncertainty, or standard error. Additionally, when they plug their results into their equations to get a final value, they include the standard errors as well. For example, they’re not content with knowing that the earth is about 4.5 billion years old. They want to know how far on either side of 4.5 billion years the “real” value might fall. So they will tell you that the age of the earth is 4.54±0.05 billion years, or an error of about ±1%. This means they have a 95% confidence that it is older than 4.49 billion years and younger than 4.59 billion years. For comparison, the error in your car’s speedometer is about ±2.5%. There is no guesswork involved in calculating error bars. On the contrary, they are measured and calculated according to specific statistical formulae. It’s important to realise that error bars don’t represent “hard” limits; they only represent the “spread” of your results, and as such, a probability distribution for what future measurements are likely to report. 68.2% of results will be within of the mean. 95.4% of results will be within of the mean. 99.8% of results will be within of the mean. The number of results further than from the mean will be negligible. The standard error of the mean is usually used when a large number of readings have been taken with a view to pinning down a value as accurately as possible. Loosely speaking, it gives the probability distribution for the “real” result as opposed to the probability distribution for future measurements. What to look for in evidence for the age of the earth. This is a very basic introduction to how measurements are taken and how errors are calculated, but hopefully it will give you a flavour for the process involved, and an understanding that far from being guesswork, it’s an exact, rigorous and systematic discipline. There’s a lot more that could be said on the subject: for example, there are specific equations to use when fitting a line or a curve to a graph. Similarly, I haven’t said anything about systematic errors either: these are errors that may affect all measurements in an experiment to an equal extent, and may be caused by such things as contamination, zero errors, or mis-calibrated equipment. A whole raft of techniques are needed to deal with these errors, but the problem is by no means insurmountable. The way they are handled is very similar in many respects to the way that historical assumptions are handled. The most important thing to take away from all this, however, is that errors and uncertainties can be, and are, quantified. This one fact is the point of failure for many, many young-earth arguments. They try to demonstrate, for example, that radiometric dating is “unreliable,” or that certain assumptions are “generous to uniformitarians.” This kind of talk is completely unscientific: real scientists will attempt to quantify exactly how unreliable radiometric dating is, and will want to establish precise limits on how much historical rates could have varied. When you’re reviewing young-earth evidence, always look for the error bars. Are they quoted consistently? They may quote them some of the time but not others. Are the error bars that they are omitting likely to be large enough to nullify their arguments? Are they rejecting high-precision measurements with tiny error bars in favour of low-precision measurements with large error bars? Are they giving equal weight to both high-precision measurements and low-precision measurements? (This was one of the fatal flaws in Barry Setterfield’s c-decay hypothesis, for example.) Are they interpreting them realistically? You may see them highlight a discordance of, say, here and there, but realistically, does that justify claims that the methods concerned can’t distinguish between thousands and billions when is just one or two percent? Somehow, I think not. When you are told that some new source of error in radiometric dating has been discovered, for example, your first question should always be, exactly how much of a problem is it? If you can’t get a straight answer to that question, treat it with a hefty pinch of salt. Chances are, it’s far less of a problem than it’s being made out to be. As I’ve already said many times before, bad arguments do not build faith. On the contrary, they undermine it. Claims that are easily falsified, or that just demonstrate ignorance, will completly undermine your credibility, and if you are attaching a significant doctrinal importance to them, you will effectively be undermining the credibility of the whole Bible as well. If you are going to respond to the theory of evolution, let alone attempt to refute it, it is essential to have a correct understanding of what it actually claims, what evidence you are dealing with, and how the underlying science works. Unfortunately, I keep hearing arguments being made for a young earth and against evolution that not only get this wrong, but they do so in ways that speak of total cluelessness about these matters. So without further ado, here are some very basic things that you need to know before you even start to discuss the subject. 1. Science is built on a foundation of mathematics and measurement. Whenever you hear scientists talking about their conclusions, there is one thing you can be sure about: they have reached those conclusions by measuring things and running those measurements through mathematical models. I shouldn’t need to say this, but I have seen YEC arguments out there that seem to be completely ignorant of the fact. Claims that the age of the earth is “guessing at best,” or that “rocks don’t come with timestamps,” fall squarely into this category. You can of course question whether they are measuring the correct things, whether there are other measurements that they also need to take, and whether their mathematical models are an accurate reflection of reality. Scientists ask these questions all the time, though when multiple independent models all give the same result and there aren’t any credible models that point to a consistent alternative, the chances are pretty strong that those models actually work. But ignoring the mathematical and numerical aspects to the debate altogether, or treating them as if they are irrelevant, will just make you look ignorant, and quite possibly intellectually dishonest into the bargain. There are two things you need to be aware of about mathematics and measurement. The first is that you won’t get different results by looking at them through different “glasses.” One plus one is still two, and Mount Everest is still 8,848 metres tall, no matter what your presuppositions. The other is that they give very specific results. The earth is not simply “billions of years old”; it is 4.54±0.05 billion years old — that is, it is known with a precision of just one percent. You don’t get an accuracy of just one percent out of numerically vague and non-specific starting points, and “an a priori commitment to billions of years, evolution and philosophical naturalism” is about as numerically vague and non-specific as you can get. 2. Science is also built on a foundation of testable predictions. As we’ve already seen, the claim that “historical science” is based on untestable assumptions is completely untrue. 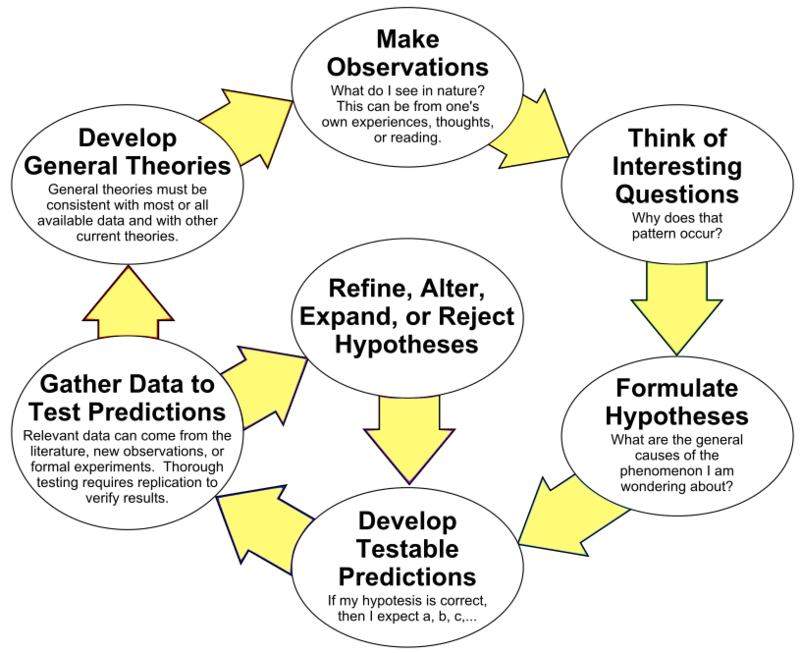 Asking “were you there?” simply tells the world that you haven’t a clue how the scientific method works. Every scientific theory starts out with two things: a hypothesis, and some tests for that hypothesis. For example, biologist J.B.S. Haldane said that the theory of evolution would be falsified if we were to find rabbit fossils in Precambrian strata. We don’t. Similarly, the view that Noah’s Flood was global in extent rather than regional, and was responsible for creating the fossils, is also a testable hypothesis. Flood geology predicts that we should find whale and plesiosaur fossils in the same strata (we don’t) and that we should see evidence of salt water, melting, or sedimentation in ice cores from Greenland and the Antarctic (again, we don’t). If you are relying on untestable assumptions, you aren’t doing science, it’s as simple as that. On the contrary, you are doing philosophy or metaphysics — and those are completely different subjects. Scientific theories are not just interpretations of the evidence. They are interpretations that are made by following strict and systematic rules. One does not simply take any old interpretation of the evidence that shoehorns it into six thousand years and call it “science.” If you could, you could just claim that the Four Blood Moons were evidence for a young earth, because treknobabble. It must be free from arithmetic errors. It must not fudge or cherry-pick the raw data. It must neither exaggerate nor downplay the significance of uncertainties and discordances. It must not take shortcuts. It must verify its integrity by testing against controls where appropriate. It must not misrepresent the extent or nature of the evidence. It must not quote mine. It must not be resistant to reasonable critique. These are basic rules of honesty and quality control. To break them in order to “fit Scripture” is neither scientific nor Scriptural. Deuteronomy 25:13 and Proverbs 11:1 tell us that we must be honest in how we handle weights and measures, and as I made clear in point number one, weights and measures are the foundation on which science is built. Two of the most important rules of science are peer review and reproducibility. One set of studies by a single team is not sufficient to establish scientific evidence for anything; the results need to be reproduced and confirmed by other teams, and there must not be any contradictory studies. There’s a very good reason for this requirement. If new scientific theories could be accepted on the basis of a single study, you’d be opening the door wide up to cold nuclear fusion, superluminal neutrinos, anti-vaccination, astrology, homeopathy, water divining, and reading tea leaves. Unfortunately, I am yet to see any evidence for a young earth that meets even these most basic standards of quality control. Almost everything I’ve seen so far falls far, far short. Now when you read the popular scientific press, it may seem to you that scientists are always changing their minds. One week, you will read that something causes cancer; the next, you will read that it prevents it. Or you may read that they can’t make up their minds about exactly which hominin fossil relates to which. Most of this is sloppy science journalism. Science journalists are not scientists; they are journalists. They have to dumb things down for a non-technical audience, and very often they also have to spice things up in order to sell more newspapers or attract more Facebook likes. In both cases, accuracy goes out of the window. Research is often publicised prematurely before it has had adequate peer review or been confirmed by other studies. The main areas of disagreement among scientists — where they genuinely do seem to be changing their minds — are almost always in the fine details, in relatively immature areas of research, and in subjects that have little other science depending on it. These are areas where there is not enough data to differentiate between one hypothesis and another. On the other hand, scientists rarely if ever change their minds about well-established theories that are backed by large amounts of differentiating data, or that have a lot of other science that depends on them. The scientific consensus on the age of the earth and the Big Bang has not changed in over fifty years. There is a lot of debate among scientists about exactly how evolution happens. This mostly concerns matters such as exactly which fossils relate to which others, and which mechanisms are the most important. But there is no uncertainty whatsoever about whether evolution happens. Uncertainty about “how” does not imply uncertainty about “whether”: when you see a cat from a distance, you can still tell that it is a cat, even if you can’t make out its whiskers. 5. “Evolutionists” do not study the age of the earth. I am constantly hearing YECs saying that “evolutionists” have decided that some particular rock layer is so many million years old. There are two problems with this. First of all, evolution is not the study of the age of the earth. Evolution is the study of how populations of species change over time in response to environmental pressures. It is a sub-topic of biology, although it has also found applications in computer science and software engineering. The age of the earth, and the ages of rock strata, on the other hand, are the subject of geochronology — a subject that sits at the intersection of geology, chemistry, and physics. It is a totally different subject. Secondly, this casts the word “evolutionist” in the role of being a derogatory term for any kind of science that you don’t like. As such, it is purely an ad hominem argument, it is confrontational in tone, and it does nothing to address the central points of the arguments in question. 6. Evolution is not “just a theory” — it is an evidence-based theory. All theories in science are evidence-based, and the theory of evolution is no exception. In this day of smartphones, anyone hearing you suggesting that there is no evidence for evolution can easily whip out their iPhone or Samsung Galaxy and type “evidence for evolution” straight into Google as you are speaking. If you’re going to try debunking evolution, you need to show that the evidence is ambiguous or misinterpreted, not pretend that it doesn’t exist when quite clearly it does. Dr. Wood rejects evolution because he believes that there may be other factors at work that science is not currently able to investigate that could provide an alternative explanation for the evidence. That’s fair enough. But to suggest that the evidence does not even exist is simply not getting your facts straight. 7. Evolution does not predict that cats should turn into dogs. If you are going to attempt to debunk a scientific theory, it is important that you make sure you are debunking what it actually claims, and not some straw-man caricature of it. I frequently hear objections to evolution that say that nobody has ever observed a cat turning into a dog. Evolution does not claim that cats should turn into dogs, but that both descended from a common ancestor which lived about 42 million years ago. Another straw man argument that I often hear is that you can’t produce a quote from Shakespeare by dropping a bag of Scrabble tiles onto a table. Evolution does not claim that should happen either — on the contrary, it claims that meaningful information comes about through a series of small, random changes being filtered out by non-random selection processes. “Uniformitarianism” is another common misrepresentation. YECs are constantly claiming that geologists blindly assume that all rates of change were constant, and reject the possibility of catastrophic events. This claim is completely untrue. Scientists do not assume that any rates are constant unless there are solid theoretical and observational reasons to do so. Furthermore, they recognise that catastrophic events have happened in the past. The K/T extinction event, and its associated asteroid impact at the end of the Cretaceous 66 million years ago, are the best known example. 8. There have been 150 years of research into evolution since Darwin. Finally, if you are going to try to discuss any scientific theory, it’s important to make sure that your information is up to date. Darwin first published On the Origin of Species in 1859. In case you hadn’t noticed, that was one hundred and fifty-eight years ago. In the last century, we’ve had Nebraska Man, Piltdown Man, Neanderthal Man, Peking Man, and a selection of bones known as ‘Lucy’ found in the Ethiopian deserts in 1974, later identified as being that of a tree-climbing monkey. All but one of these examples are more than ninety years old and some of them date back as far as the nineteenth century. There is no mention whatsoever of more modern findings such as Homo naledi, Homo floriensis, Australopithecus sediba, and so on, let alone findings of non-hominin transitional fossils such as Tiktaalik roseae. Any honest discussion of evolution needs to take into account the latest research — not just concerning the fossil record, but also from other directions as well. For example, I would expect to see a discussion of the Human Genome Project, and the whole subject of comparative genomics in particular. This is an area of study that has only been made possible in the past twenty years or so with the widespread availability of vast amounts of computing power. A modern consumer laptop computer can now do a complete comparison of human and chimp genomes (each of which consists of about three quarters of a gigabyte of data) in just a couple of days. This is a level of computational power that wasn’t available thirty years ago. Cross-checks test assumptions. They do not make them. Literal Six Day Young Earth Creationists believe that “historical science,” as conducted by “secular scientists,” relies entirely on assumptions of uniformitarianism — the idea that the rates at which natural processes happened in the past has always been the same as it is today. As we saw last time, nothing could be further from the truth. Scientists do not blindly assume that rates of change are constant: on the contrary, they carry out numerous cross-checks between different methods to establish which of them have been constant and which of them have not. What has the LSDYEC response to these cross-checks been? In a 2010 article on creation.com, Dr. John K Reed attempted to address this question. His response completely missed the point. Like the Lake Suigetsu argument, the next case also makes the attempt to demonstrate how multiple lines of evidence all lead to the same conclusion. But while the data might be independent, the worldview in the mind of the researchers is not, and worldviews always shape perceptions of reality. This time, the authors take us to the other side of the world, to the Atlantic Ocean’s mid-ocean ridge. We are told that after geology proved a steady spreading rate over 180,000,000 years, that satellite measurements have triumphantly confirmed that rate. This is an argument that I’ve seen other young-earthers raise from time to time — that different measurements only give the same results because they make the same assumptions of uniformitarianism — and it is complete and utter nonsense. It gets cause and effect completely the wrong way round. The whole point of cross-checks is to test the assumptions that rates were constant, not to make them. Worldviews may shape perceptions of reality, but they do not shape the results of measurement and mathematics. You can adopt a worldview that Mount Everest is just four inches tall if you like, but that won’t change the fact that you get a height of 8,848 metres when you measure it. The technical term for letting your worldview shape the results of your measurements is “scientific fraud,” and its consequences are at best a career change to flipping burgers in McDonald’s, and at worst a prison sentence. To see why cross-checks are an effective test of constant rates, let’s assume the reverse: that the different rates were not constant. This could only happen if there were some factor at work that affected them in exactly the same way, to exactly the same extent, in exact lock-step with each other, by a factor of up to a billion, depending on the timescale you want to argue for. If the rates of nuclear decay and continental drift had not increased by the same amount, you wouldn’t get the same results. If there were any lag between them, you wouldn’t get the same results. Then you have to consider other rates that must have increased in lock-step with the two. Annual lake varves and ice layers would have to have been deposited at a rate of a billion per year — that is, more than thirty per second. There is no known physical process that can do that. Once again, there are too many weak links. How do we know that the seafloor has been spreading at the same rate for 180 million years? A few scattered dates of oceanic rocks? One would think at a minimum that a dense grid of dates would be required to prove such a claim. But even the sparse dates might be more convincing if they were actually dates of the oceanic basement. Or if we could trust radiometric dating, despite its assumptions and anomalies. Finally, a few years of satellite measurements alone cannot possibly prove 180 million years of constant spreading. I would have expected him to have given a link to a high-quality scientific journal such as Geochimica et Cosmochimica Acta in support of his assertion that the dates are sparse and not of oceanic basement, but he doesn’t. The article he cites (without giving a clickable link) was published in the Journal of Scientific Exploration — a publication devoted to the study of all sorts of New Age fringe science such as ufology, astrology, palm reading, alternative medicine, and so on and so forth. Its peer review processes are lax, and the journal editor actually admitted that several reviewers had recommended against the article’s publication. The author, a certain David Pratt, has a copy of both the article itself and the editor’s comments on his personal website, which is devoted to all sorts of wild and wacky theosophist theories such as karma, reincarnation, and “cyclic evolution” (whatever that is). In any case, this data does not only come from the Atlantic and the Pacific basins, but from all over the world. It is also just one of many, many cross-checks that are carried out between a wide variety of different dating methods. The number of studies in the scientific literature easily runs into the hundreds of thousands at least. Even if the Atlantic Ocean dates are “sparse” and “scattered” as he suggests, the overall data most certainly is not. We also challenge young-Earth creationists to desist from labeling modern geology as uniformitarian when they know full well that modern geologists repudiate any a priori commitment to slow, gradual process rates in the geologic past to the exclusion of all catastrophic events. Again, we see that he has completely missed the point. The whole point of cross-checks is to test where “a rigid uniformitarianism” has held over time. Geologists do not blindly assume that all rates of change are constant, and they do not blindly reject the possibility of catastrophic events. For someone who is a PhD geologist himself to suggest that they do so is quite dishonest.